Hola amigos. We know it’s been a stressful week with midterms and all that but hey, its the weekend, AND its Halloween, so do it up! 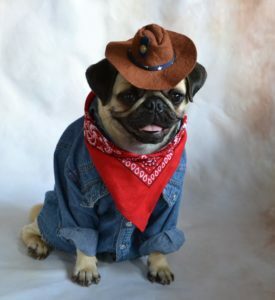 We condone dropping $$$ if you can look as good as this pug. How much is too much to spend on a Halloween costume? I personally believe that kids should spend like no more than 50 bucks on a costume since they’ll wear the costume max twice; once to school and once trick-or-treating. DJRC, on the other hand, thought that Halloween should be time for a kid to flex a dope costume on people. In his eyes, no cost should be spared. We both seemed to agree that when you’re older, you shouldn’t be spending ANY money on a costume, since, this is literally an outfit you’re going to get drunk in once. DJRC pointed out that Halloween, when you’re older, isn’t as fun as when you were a kid and said he would be going out this weekend whether it is Halloween or not. I look forward to the future when I take my kids trick-or-treating, but RC didn’t like the responsibility associated it. At the end of the day though, this is merely our humble opinion, so if you disagree let us know why. a rock if you know nothing about the man, the myth, the legend, Big Shaq (aka Roadman Shaq). We covered him in our first szn of Power Hour, but the hype has not stopped regarding this rapper, so why not talk about him again? He’s that guy from all the “ting goes skrrraaa” memes, but he wasn’t always a meme. He got his start on Roll Safe‘s BBC documentary regarding life in London, and after the show’s success, he was offered a radio show on BBC Radio 3. He really got his come up, though, when he featured on Charlie Sloth‘s “Fire in the Booth.” This is the video that everyone’s seen, Shaq’s freestyle has been all over Instagram and Twitter. Two days ago, Shaq released an Official Music Video, one that’s hit almost 5 million views in three days, and boasts locations such as Miami and Toronto, and artists such as Lil Yachty and DJ Khaled. The question is: is this guy living in his five minutes of fame, or is he bound for greatness? I think that he might have a chance of collabing with the likes of Khaled and others in the future and that his musical path is just beginning. RC thinks that this is all a joke for laughs and that Shaq can’t be serious. You know that us lads at Power Hour will keep you posted on Shaq’s future, so keep it locked. 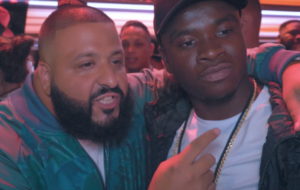 Big Shaq (right) with DJ Khaled at a BET afterparty. As always, with a little help from our main many Aubrey Graham, myself and DJRC hit up our top fives. Our list this week had a spooky little Halloween twist. I’m a huge fan of horror movies, RC… not so much. Despite RC’s take on horror movies, here are our top five. A little heads up that this week was Thrive Week in the Laurier community. Although the events are over, RC and I urge you to talk to people if you’re not feeling well. We also hope that you keep being true to you, and remember to put yourself first. There are lots of great resources at Laurier that would be happy to help and see you thrive.